Interesting about what that comet did. I am happy that human understanding may be getting to a diagnosis of what is real about Mars in the regard to atmospheric losses. I should think that if there were to be a solar civilization, then the investment in Mars will be worth it, as it's value should go up and up, as such a civilization progresses. Thought you might be interested in this, in relation to the topic. A new NASA study shows that solar wind — the stream of electrically charged particles that the sun blows out into space — creates a complex electrical environment on Phobos, which could possibly affect astronauts and any scientific equipment brought to the irregularly shaped moon in future missions. I am wondering if we can harness the charge that is built up on the moons of mars via the solar winds...it just might give us a way to create a belt around the planet to ward of the lose rate of mars atmosphere by circling the planet at the moons distance with nuclear power rf transmitters such that a field is slowly built up. I would have thought the quickest approach was to use solar power satellites. The Earth now has orbiting over 2000 satellites and tens of thousands of smaller objects. I would have thought that using solar power we could use a network of smaller satellites to generate an electro magnetic sphere around Mars. Of course the amount of energy required to create an Earth-like magnetosphere would be way beyond our capability...but I am presuming the amount of energy required simply to construct a very thin non-pervasive magnetosphere would be far, far less and potentially doable with solar powered satellites. The satelite question is one of stationary or fast orbit as the field would want to move with the rotation of them and the planet to help with the setting up of the field. We've performed initial modeling of a local artificial geomagnetic field, scaled for a crewed facility on Mars. The field covers a crater 9 km in diameter and blocks cosmic ray protons to 1 GeV. Power requirement is under 80 kW. This is the "Omaha Field", one component of the greater "Omaha Shield" proposal. That's brilliant! Presumably if you can do it over a large 9 Km diameter area, you could do something proportional over a much smaller early base. Sure, you could. You'd change horizontal scale by adjusting cable length. The critical dimension is vertical; i.e., vertical spacing between cables. 1.5 km gives shielding to 1 GeV, and shielding drops ~100 MeV per each 100 m cut in spacing. I see you have found one of the old topics on the subject of megosphere creation, that said I have added the others in my post in your new topic. Also links to superconducting power cables. This article has me quite confused. If it is true, it is another strike against those who say that planets around red dwarf stars would loose their atmospheres quickly. I have had concerns about that assertion for some time, since Venus has an atmosphere many times thicker than the Earths, but does not have an appreciable magnetic field where it counts, just an induced magnetic field in its ionosphere. Something is bogus about the notions we are given about of how a planet retains atmosphere. Because Mars is 1.5AU from the sun, it doesn't suffer from atmospheric thermal loss (Jeans escape), but it still suffers from solar winds stripping the atmosphere. This form of atmospheric loss increases the closer the planet is to the star, and how active that star is. The habitable zone is extremely close to Red Dwarf stars, and red dwarf stars are extremely active early on. The closer a planet is to it's star, the more likely it is to be tidally locked, which also means that it is less likely to have the rotation necessary to maintain a significant dynamo in it's core to keep a magnetic field. M stars are the most common, and live for a ridiculous amount of time, unfortunately, it seems that they're not very friendly to planets in their habitable zones. G stars are reasonably friendly, but have a limited lifespan. For example, Earth has been around for ~4.5Gya years, it took the first 0.5-1Gya until the planet was habitable, then 3-3.5Gya until complex life formed, then 0.5Gya from complex life (worms) forming to intelligence forming (us), and we now have less than 1Gya until the Earth is no longer habitable. It's a relatively small window for intelligent life to form under a G type star. However, between M type and G type stars we have K type stars, more friendly than M type, and more common and longer lived (longer than the current age of the universe) than G type stars. This would be my target star for exoplanet atmosphere biomarkers. Edit: Venus is massive enough to retain it's atmosphere even at Mercury distance from the sun, as is Earth. A magnetic field can only help less massive worlds (Mars has only 10% of Earth mass) retain their atmosphere when they are cold enough. Don't forget that Mars still has an atmosphere, yes much has been stripped after billions of years, but it still retains enough of an atmosphere for liquid water to be possible at it's lowest elevations on summer days. Was thinking about this topic as the field height above the planets could be extended via the use of a balloon platform with solar panels on the top with a field generator with in its structure. So long as it stays afloat we then can make more of these to interlock the fields at altitude in order to strengthen it. As we add more atmospherwe will be able to have the balloon float higher and higher to make the field better plus as we get higher add in more balloons. We really don't need to worry about a magnetic field for Mars. If we give Mars an atmosphere it will last for hundreds of millions of years (the Earth won't even be habitable in much longer than that). Still, if you must, then you can wrap super-conducting cables around the planet and create a magnetic field that way, there's really no need to spend the effort on raising it up above the surface (that's the magic of magnetism after all). The Earth continuously receives 3,700 billion watts of power through the transfer of the gravitational and rotational energy of the Earth-Moon-Sun system, and over 1,000 billion watts is thought to be available to bring about this type of motion in the outer core. The last full reversal, the Brunhes-Matuyama, occurred around 780,000 years ago. A temporary reversal, the Laschamp event, occurred around 41,000 years ago. It lasted less than 1,000 years with the actual change of polarity lasting around 250 years. Could anyone provide me a schematic/diagram for Lake Matthew Team's Omaha Field proposal, or a link to it? I've seen its claimed power requirements and energy-blocking capacity, but I'd like to be able to see a diagram of its circuitry and power sources if possible. Thanks! The basic Omaha Field figures are given in the Mars Home Planet submission. Note the use of straight cables, solenoids, and mixed cables in construction of the protective field. Also the Omaha Field proposal is integrated into a greater Omaha Shield concept, described in a Nov. 16 2017 press release. The atmosphere loss for all planets from the present day Solar Wind is negligible. Mars -if given an Earth normal surface pressure - would also have a much lower cosmic ray flux due to the mass of the atmospheric column being higher to have the same weight on the surface, and its gradient is much lower thus cosmic ray fragments would decay more before reaching the ground. Especially muons. Interesting...people often seem to think the atmosphere would get blown away by solar wind in a matter of a few decades, whereas the reality is that it would be hundreds of thousands or millions of years before you got significant loss by which time we will surely have found some technical solutions to the problem e.g. an artificial satellite-based magnetosphere. I try to use the resources on hand for a solution. For instance the ultraviolet flux in the upper atmosphere. The story of Venus is said to be that the oceans heated up and water vapor got into the stratosphere. U.V. split it, and Hydrogen and in the suns more magnetically active youth also possibly Oxygen were swept away. So now arrange to do that on Mars. The sun is not so magnetically active, so I think much of the Oxygen would be retained. So, how to get water into the stratosphere of Mars. (It's atmosphere technically is pretty much all stratosphere). One way would be to get water from asteroids (Too hard I think). Another is to use a orbital focus from a concentrating mirror to create an atmospheric vortex, sucking moisture from the polar ice caps up into the high sky. (Which is currently very dry). (That rhymes). Once in the high sky, it may be very hard for the moisture to condense to a particulate that can precipitate out of the sky. That might be true, both if the air pressure is very, very low, and if dust particles to condense on are absent. Such dust particles may be very hard to suspend in a extremely rarified atmosphere. And further if there were some, then they would be precipitated out of that layer in short order I think. An alternate method would be to shoot ice bullets up into the daytime sky, where in the presence of a very low pressure and sunlight they would be likely to explode and sublimate into water vapor. Of course the gun would require energy to operate. And when you were done, if you managed to achieve a 70-333 mb atmosphere, you could have greenhouses where you would upgrade the percentage of Nitrogen if necessary in the interiors, and I suppose you would also provide fertilizer. But we could hope for Clathrates of Nitrous Oxide buried in the regolith. Maybe Clathrates of CO2. 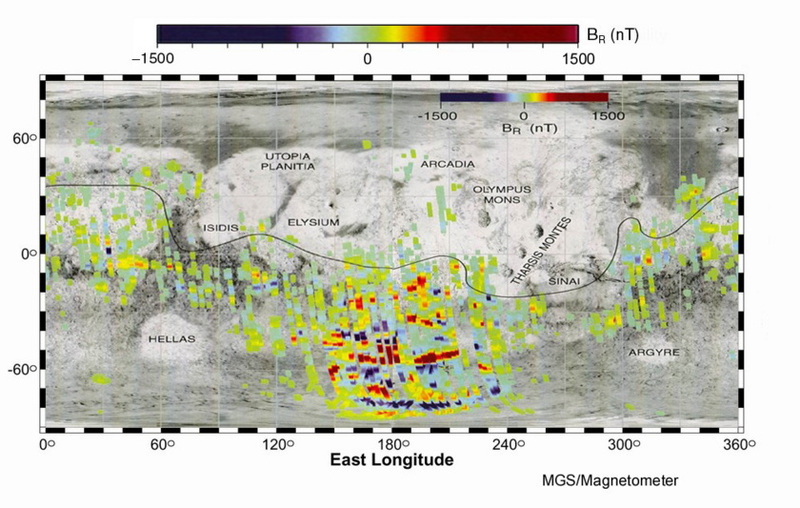 I am more inclined to believe that the bulk of the Martian atmosphere went underground rather than into space. 1) The sun was extremely magnetically active in it's youth, and indeed did strip most of that atmosphere away. 2) A giant collision blew most of the original atmosphere away after about 1/2 billion years of Mars existence. #1 or #2 could be true. There are some who say that the entire Mariner Rift Valley shows signs of a very thick layer of ice under the soil at its bottom. I believe that they speculated on a "Wet Based" glaciation. In other words, liquid water being added to the glacier by leaking to it's bottom where it would freeze. This suggests an atmospheric collapse, which might have involved other parts of the planet as well I think. Such a deep glacier with water flowing into it's bottom might also have Clathrates of Nitrous Oxide, and CO2. Or not. We need to find out. Elon has announced his method for re-creation of the martian magnetosphere. A loop field or something the size of a remnant field that already exist just stronger and is a power eater to maintain. Oh, the physics dictate something like our Omaha Field. In its first draft it's several orders of magnitude stronger than any remnant martian field, and once it's charged up it pulls < 80 kW indefinitely. If you don't read the Omaha Field material, you're just talking while in ignorance. In which case, why bother with a forum? A current through any conductor creates a circular magnetic field around the conductor due to Ampere's law. For DC or AC currents with on the field being constant with dc and with the AC it will keep flipping direction at the frequency of the applied voltage. A coil with a core which forms a closed loop, possibly with some narrow air gaps, is called a closed-core coil. By providing a closed path for the magnetic field lines, this geometry minimizes the magnetic reluctance and produces the strongest magnetic field. But a A coil without a ferromagnetic core is called an air-core coil. Which is what you are doing on mars as the quality and amount of ferrous materials is not prodictal to create the larger field. This happens when the field will not get any large no matter how much power you apply to it. Lower resistance at temperature but it expels the magnetic flux fields cooled below its transition temperature, the magnetic field is ejected. [Magnetic saturation] happens when the field will not get any large no matter how much power you apply to it. No, the saturation of ferromagnetic-core electromagnets has nothing to do with the Omaha Field strength, obviously. This is HTS current, commonly used to produce high-Telsa fields in fusion reactors. Again, you're talking while in ignorance; overlooking the shielding results, along with the sim work and refs behind the results. Can't you pull together even a casual post, after all this time?